YES Employees are the Best Staffing People in Utah! May is a month that resembles spring here in the Northern Hemisphere. Springtime brings about change and growth in ourselves and our surroundings. Our May employee spotlight, Jordyn Poll, is someone who exhibits those traits very well! 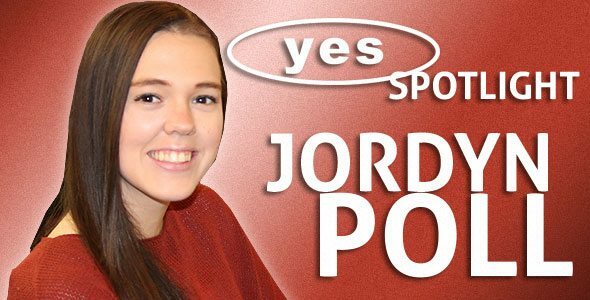 Jordyn has held a variety of positions during her time with us here at YES, and we find great value in her adaptability and eagerness for learning and personal development. Her growth in the last couple of years has been so great to watch and be apart of. We are so grateful for her flexibility and that her desire for development reaches far beyond herself, too, as she helps our company continually grow as well. One Tree Hill, summer, chocolate chip cookies, accounting, and lipstick; oh and my husband too. Closed toed shoes, spiders, and mornings. I like building relationships with people. I also really like knowing that by helping people find jobs that it helps them provide for their families. I think YES is pretty awesome, but I am not a morning person, so I would have to say work not starting until at least 9 am. Tim McGraw because he's hot and I love his music. Definitely Toronto, Canada. I think YES should open an office up there so it gives me an excuse to live there for the rest of forever. 7. What kind of cows make chocolate milk, which ones make strawberry milk, and which ones make almond milk? Not getting frustrated when people don't show up for work or don't take the job very seriously. I think doing a better job at helping them realize why their specific job is important and that they are needed just as badly as everyone else will help. If people feel important and wanted I think they will take the job more seriously. We will do everything that we can to make sure you get the best job available for you, but it's up to you to make the most out of it. 11. We hear you won a national championship in high school with your cheerleading team. Who would make the better cheerleader on your team, and who would have been cut, the President of YES Reed Laws or YES' CFO Kerry Westenskow? Why? I heard that Reed used to be a gymnast, so I'd have to go with Reed. Besides, I think Kerry is a bit too quiet to be a cheerleader. I'd like to see both of them with bows in their hair though! Thank you for all that you do here at YES, Jordyn. You're amazing!